At breakfast we saw the woman from yesterday who was also doing a 13 day tour, except with Peregrine travel. She described a tour itinerary almost identical to ours, and we are wondering if she will actually end up on the same your with us, being run jointly for several companies. Stuffed, we returned to our room to contemplate the day. We decided to check the hotel desk for any information about our tour and to call Intrepid if there wasn't any. There was a new guy at the desk with very good English who told us the tours usually meet at 6pm, and that the leader would be in a bit before to post messages on the lift. So this gives us most of today free to do what we want. We are sitting in Caffe Vergnano in the Morocco Mall, which is apparently the largest shopping mall in all of Africa. We've been here at the mall for a couple of hours, and are relaxing with an after lunch drink. The first thing we did this morning was to walk out to the old Sacre Coeur cathedral. As soon as we left the hotel and crossed the road, a man came up to us and claimed to have seen us in the hotel because he worked there. He asked if we were from Australia, and said he had a cousin or something living in Melbourne. Then he started telling us about a special market event being held today, the one day of the year when lots of Berber traders come into town to show off and sell stuff. He said it was a hundred metres or so up the road and we should go have a look. Then he started to say "Come, I'll show you where it is," at which point we insisted we had other plans for the morning and started walking in another direction. He left us then, and when I asked Michelle if she had recognised him from the hotel she said that she hadn't either. After we came back from the cathedral, we tried to find the place he was talking about, but we didn't see anything like what he described. We figured he was probably telling us tales to get us to follow him to some friends' shops where they would rip us off or something. Anyway, we headed to the cathedral as planned, but got slightly turned around by taking the wrong street early on, and had to use the map on M.'s phone to reorient ourselves. Eventually we found the cathedral and I said there might be a service on since it's Sunday. But as we approached we noticed a group of boys playing soccer in the open area between the cathedral front door and the gate to the street, which seemed weird. The cathedral door was open, and when we went inside we discovered that it was no longer a place of worship, but had been converted into a public exhibition space. The interior was very run down, but the stained glass windows were still there and gave the place an eerie feel. All the furniture and the altar had been removed, and in their place was an exhibition of paintings and sculptures. A man sitting at a table near the door waved us in, and said we could also climb the tower to get a great view of the city. We walked into the exhibition space first and looked briefly at the artwork, but also at the architecture of the ex-cathedral, which was pretty tall and impressive. It looked like the entire building had been made of concrete, and although there was plenty of stained glass it was all in small pieces in small holes in the concrete walls. After looking around the ground floor, we went to climb the tower, for which the man at the door charged us 20 dirhams each. Another couple had gone up just ahead of us, and we heard them making bird noises as they climbed the heavy concrete and brick steps. The tower was full of bird guano, and fluttering pigeons as we disturbed their rest. The smell as we entered was quite piercing, but we soon got used to it as we climbed about ten floors up to the top of the tower. There was a door out to the roof of the cathedral at one level, and we could have walked all over the roof, but we didn't because it curved to a downward slope and then a long drop to the ground below. A little higher was a door to the walkway joining the two towers, and we spent some time here taking photos. The other couple were here as we arrived, and we got them to take a photo of us. They went up to the tower top and came down just as we went up. 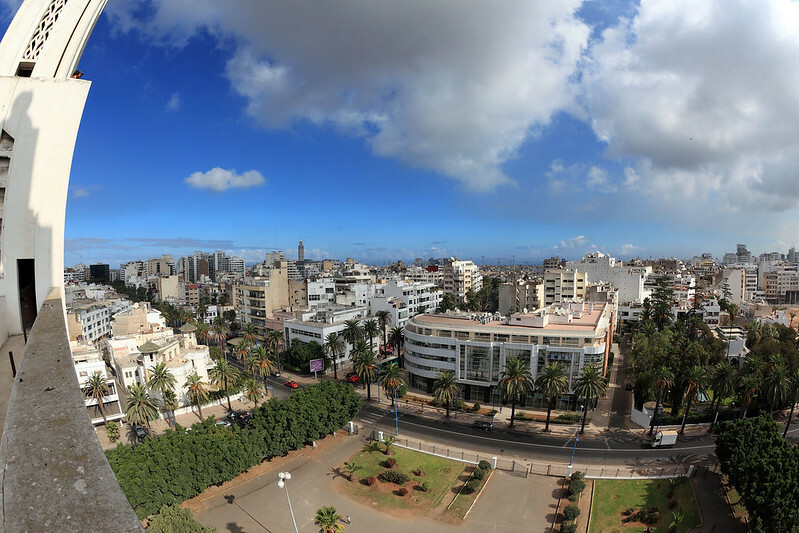 The view from the top was well worth the effort, with a 360° panorama of Casablanca below us, including the taller tower of the Mosque to the north. View over Casablanca from the roof of the cathedral. The weather had clouded over a bit with some grey cumulus blotting out the sun. It looked as though there might be rain later, but now the clouds have cleared and the day is hot and clear again like yesterday afternoon. After leaving the cathedral we walked back to the old medina to see if we could find the Berber market the man had told us about. We didn't, but we did find a much more bustling section of the medina, with lots of food for sale including fruits, bread, fish, meat, spices, grains, and so on. This was much more interesting than yesterday. It was crowded and moist and smelly and the ground was a bit unpleasant to walk on, but it was an amazing experience. 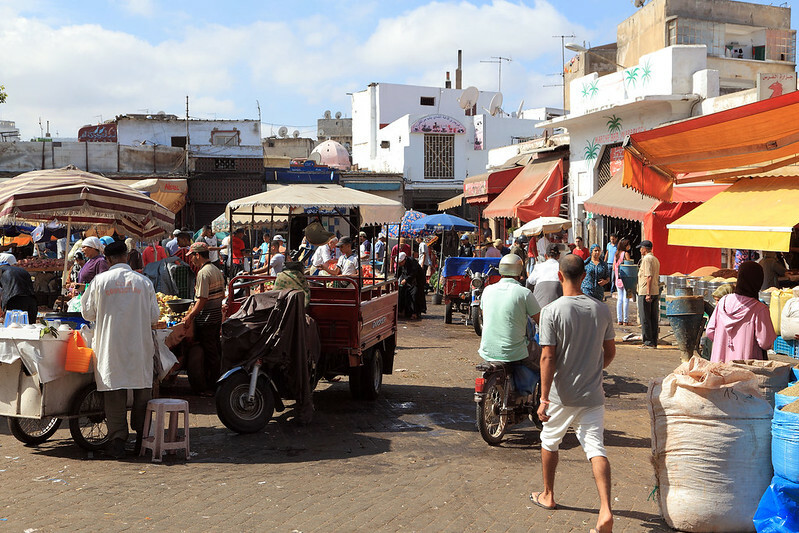 Market in the medina, Casablanca. About 11:00 we hailed a taxi and had the driver take us out to the Morocco Mall, which is on the coast in the far western suburbs of the city. The drive itself was interesting, as we passed a lot of places along the coast and saw plenty of people down on the beach and swimming in the ocean. There was an ice cream stand at the street about every hundred metres along the beach, which stretched for kilometres. Back in the city we drove past a man who was holding up a puppy, apparently trying to sell it to a passing car. Eventually the driver dropped us at the mall and we entered the the blissful shade and air conditioning. The sun was hot and it was good to get inside. We wandered around slowly until we felt like lunch, then checked the food court area on the third level. There was a lot to choose from, but even though it was after midday many of the stalls were closed or just preparing food to get ready for selling. We looked at a few places, including this Caffe Vergnano, but it turned out to be mostly drinks and a few cakes, not lunch food. Instead we found an Italian place called La Farfalla, which made freshly prepared pasta and pizza. The woman there spoke to us in French as we perused the menu, and offered us some bruschetta to try. I had a piece and it was very good. We ended up ordering a spaghetti puttanesca for me and penne arabbiata for M., plus a couple of bottles of water, all in French. I apologised for my poor French and said I spoke English, and the lady immediately switched to good English, saying she thought we only spoke French! The pasta would take ten minutes to cook, and we learnt that the chef was from Italy and made everything to order. A man brought the pasta to our table a few minutes later, with a generous amount of grated Reggiano Parmagiana cheese. We tasted the pasta and it was really good, perfectly cooked and very tasty. We thoroughly enjoyed our lunches, and let the woman at the shop know as we left. I was amazed that the chef would open a fast food place in a food court instead of a proper Italian restaurant. 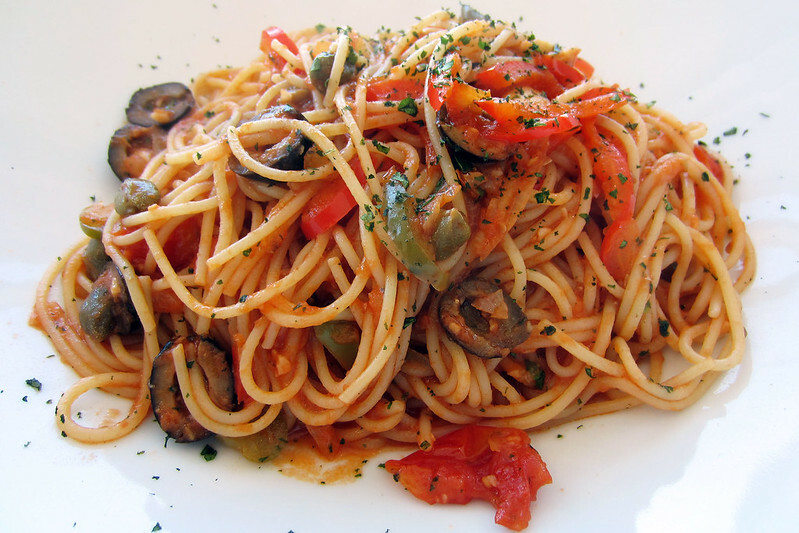 Spaghetti puttanesca from La Farfalla. Morocco Mall, Casablanca. After resting a few minutes to enjoy the view from our table over the Atlantic Ocean, we moved back to the Caffe Vergnano for M. to get a coffee. I decided to get a hot chocolate, which was the thick Italian style and yummy. And now we're sitting here relaxing as I type this! We are back at our hotel, waiting for the 18:00 tour group meeting. After having our restful and extended lunch at the mall we continued walking around to see it all. We found the small souk section, which was a circuit of narrow passages with small shops extending off it, like an old marketplace, but built new as part of the ultramodern shopping mall. The tiny shops in here had more traditional Moroccan arts and crafts, rather than the international fashion chains populating the rest of the mall, and were thus much more interesting. There was also a mosque secreted away amongst the souk area. Shops in the souk section. Morocco Mall, Casablanca. Just before leaving the mall we stopped in the Starbucks we saw near the entrance and bought a souvenir Morocco mug for Hailey's collection. They had trouble finding a box for it until it looked like the woman in charge of the shop went out the back and emerged with a carton of four boxed mugs. All we have to do now is carry it safely for the rest of the trip! We exited the mall to seek a taxi, and saw several hanging around. We intended to cross the road to get one going in the right direction, but before we could cross one driver urged us into his taxi. We pointed to indicate we were heading in the other direction. He indicated that was no problem, so we climbed in, and I checked to see the meter was on. Before he pulled away, another man got in the front seat to share the ride with us! The taxi backed into the roundabout behind it, then turned around to head back towards the centre of the city. The driver drove like a maniac, zooming between other cars, beeping, whizzing past pedestrians with barely a centimetre of clearance, and so on. We got close to our hotel and the meter was nearly 30 dirhams when it seemed to reset itself. The other man got out and paid his fare, speaking in Arabic. The driver then let us off near our hotel, after having to consult a business card we'd taken from the hotel to get the exact street. I proffered 30 dirhams, but he pressed a button and the meter suddenly displayed 46! I argued that that was too expensive, in halting French, and it should only be 30, but he said something about it being for two people. Rather than cause a scene over what amounted to barely $1.50, I handed over the 46 dirhams in exact change, not wanting to embellish it with any hint of a tip, and climbed out. He basically ripped us off, but at least it was only a trivial amount of money (for us). We bought another couple of bottles of water at the general store near our hotel and then went in to our room. We saw the Intrepid tour meeting notice posted by the lift, which confirmed we would meet at 18:00. It also listed Peregrine, which is the company the other woman was with, so it looks like she will indeed be on the same tour with us. The meeting of the tour group at 18:00 took about an hour and a half as our tour leader, a man named Lahcen, got our details and introduced us to various details about what would be happening and what we needed to do to stay safe. The meeting was on the upper floor of the hotel restaurant and the lighting was so dim that several of the people had trouble seeing the forms we needed to fill in, or reading the relevant information from their passports or insurance forms. It turned out that the tour was indeed a blend of tours operated by Peregrine and Intrepid, so the people in our group had variously booked through those two companies. Lahcen said we needed to be checked out and ready to leave at 08:00 tomorrow morning, for our first day's activities. 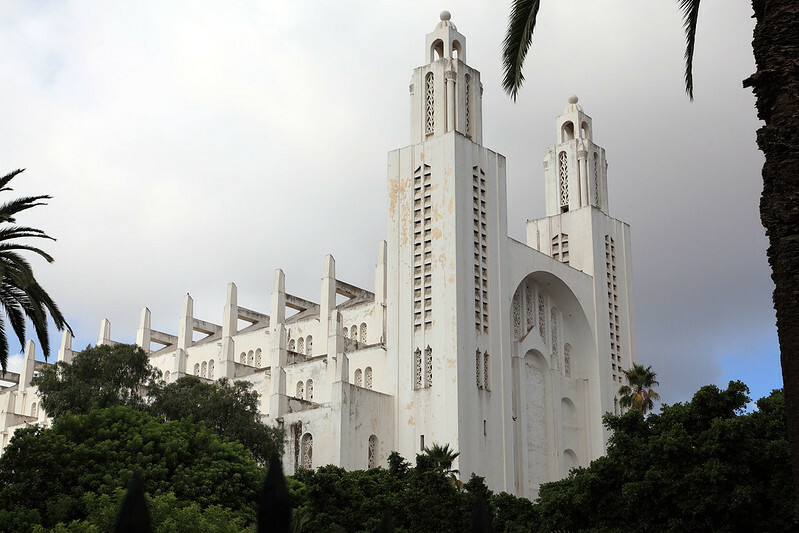 The plan for tomorrow is a visit to the Hassan II Mosque, then we leave by bus for Rabat, where we pick up a local guide who will take us on a walking tour of major sights. At the end of the day we drive on to Meknes where we spend tomorrow night. After the meeting Lahcen suggested a restaurant called Les Fleurs for dinner, which turned out to be just across the main road from our hotel. 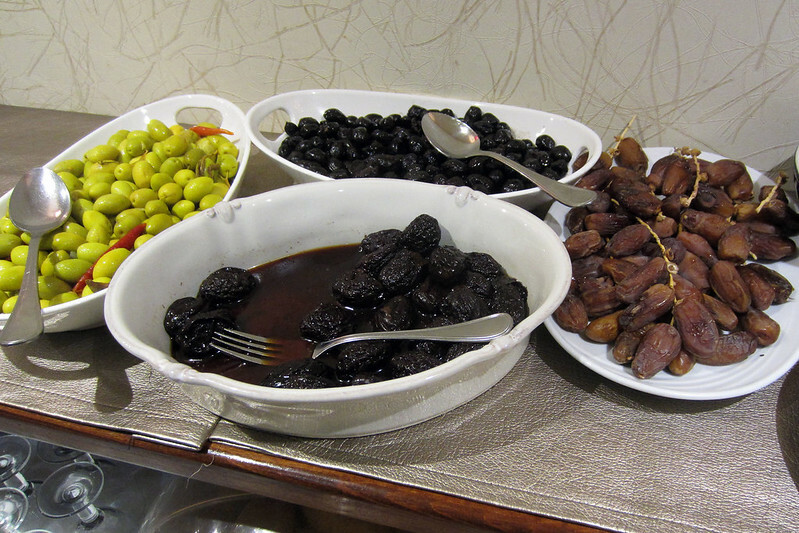 It had a nice decor in traditional Moroccan style, and a mix of Moroccan and French food. I chose a seafood pastilla to try, while M. got the vegetable couscous. The pastilla was a crispy thin crust like a crepe around a filling consisting of spiced noodles and mixed seafood, flavoured with a lot of turmeric and some other spices. It was nice, but not spectacular. M.'s couscous was covered in huge chunks of several different vegetables and sultanas and was delicious, but enough for two people, so there was quite a lot left over by the time we were done. Over the meal we chatted with Ben and Terry, two of the guys on the tour, and a bit with Leanne (the woman we'd met yesterday who was on the suspiciously similar sounding Peregrine tour) and a second Michelle (from Brisbane). There's a third Michelle too, but that was the European name of a Chinese woman who lives in San Francisco, who said maybe we should call her Zi instead. There are two women from New Zealand, and two from Canada (one Edmonton and the other from Victoria), and two retired men from Sydney - we didn't catch their names and will have to learn them over the next few days. 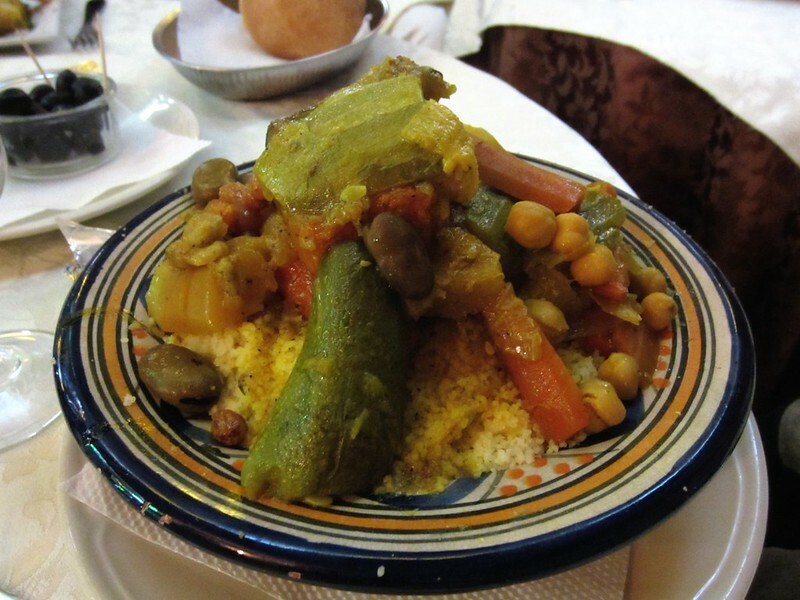 Vegetable couscous. Les Fleurs restaurant, Casablanca. With the meal done, we begged off tired and gave Lahcen 220 dirhams to cover our share of the food and tip. We headed back to the hotel to shower and flop into bed to get a solid eight and a bit hours of sleep before breakfast tomorrow. Last updated: Monday, 30 March, 2015; 01:46:03 PDT.